SATO Method enables out-of-body experiences in a safe, relaxed condition. Approx. 300 people had this experience in the 1990s. The out-of-body experience is interpreted in two different ways. One is that the out-of-body experience is the real experience of the afterworld and the other is that it only is the image created within the brain. The former is called the real experience theory and the latter is called the in-the-brain phenomenon theory. It is difficult to unilaterally determine which is right. Depending on the interpretation, either view holds good. However, there exists one point of contention where the real experience theory is of advantage. It is the case where the information unknowable by ordinary method was obtained by out-of-body experience . One of its examples is that Luukanen Kilde had an out-of-body experience in the Lapland, having seen his mother sewing a dress with a flower pattern and his sister going out on a date with her boyfriend. These were done at his parents’ home in Helsinki that is four miles away. Another example is an out-of-body experience of Barbara Harris when she had incontinence in a circle bed. During that experience, she saw a nurse having done her job just by dropping that underwear into a dryer without washing it. On the other hand, Mr. Takashi Tachibana stated about the “out-of-body experiences without near-death”. He is a Japanese journalist, nonfiction writer as well as critic. Mr. Tachibana has been consistently retained an interest in issues associated with life and death from early childhood. He has also continued holding interest in the essence of human existence. For this reason, he has been writing under various themes from a number of different sectors that are seemingly considered to be dis-related. The following is the case of Mr. K.K. who is a male of 36 years old living in Asahikawa, Hokkaido, Japan. This is, on its own, almost equal to the near-death experience. In this case, however, he was not faced with major challenges to his survival at all. It really raises a fundamental question—what is the near-death experience in the first place? ◆ Many people have had out-of-body experiences in safety with the SATO Method. 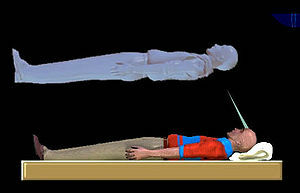 The out-of-body experiences by SATO Method are categorized as those without near-death. There is, however, a unique case of having had out-of-body experiences similar to the near-death experience. Like the near-death experience, the qigong is categorized into the yet-to-be-defined science. There seem to be many cases where the qigong is mix up with hypnosis. On the other hand, a specific example has also been reported, in which differences between out-of-body experiences by the SATO Method and hypnosis had been partially clarified. While the “qi” in itself has not been scientifically clarified, it has been confirmed that the cerebral blood flow in the hippocampus and the periphery of amygdala had been increased by the action of qigong. It has also been ascertained that, as an effect to the endocrine system, the amount of noradrenaline cortisol had been significantly decreased and that the relaxing effect had been enhanced with the NK-cell activated. While the out-of-body experiences by SATO Method are currently in the research phase, the near-death experience may have something to do with the SATO Method. As mentioned at the outset of this article, approx. 300 people had out-of-body experiences through the SATO Method and they provided a lot of information on the afterlife, previous life, micro-world in the human body, realities of the universe, historical facts, etc. It’s interesting to note that when such people were linked with the realm before the birth of the universe, many of them perceived it to be filled with the white light and ultrafine particulate energy, though the Big Bang theory is currently most prevailing. During their out-of-body experiences, they all constantly felt tranquility and joy. They also felt themselves naturally giving off light, just being filled with gratitude. It appears that the realm before the birth of the universe represents Something Great. The notion, Something Great, was set up by honorary professor K. Murakami of the University of Tsukuba, Japan who is renowned in the study of genes. The SATO Method has made a rapid progress with the “qi” of the internal world having been made more powerful. Especially, the power of the “contraction qi ” that stabilizes the body has been enhanced. As a result, the out-of-body experience by SATO Method have evolved to those that are healthier and more stable. In 2013, experiments on out-of-body phenomena are to be made in collaboration with experts in the medical science, physics and other related fields.